Does Coal Stand a Chance Against Renewable Energy? Like the president, I applaud the mine’s opening. In a region that’s been hit particularly hard by the dramatic reduction in coal demand over the past five years alone, the local economy should benefit nicely from the fresh injection of high-paying jobs and tax revenue. But does the Acosta Mine really “signal a new chapter”? 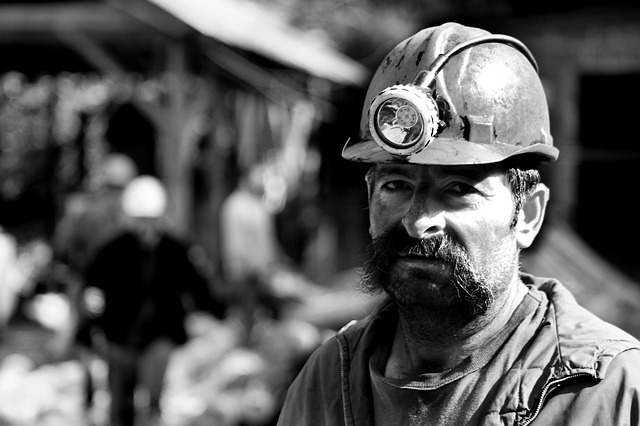 Will it stanch the decades-long loss of coal mining jobs? Will it help make coal more competitive than natural gas or renewables such as wind and solar? The simplest answer to the questions above is: Not likely. Energy markets are in full transition mode, both in the U.S. and abroad, and there really isn’t much that can be done to stop it, despite Trump’s best efforts. An April study conducted by Columbia University’s Center on Global Energy Policy concluded that “President Trump’s efforts to roll back environmental regulations will not materially improve economic conditions in America’s coal communities.” According to the report, nearly half of coal consumption’s decline can be attributed to increased competition from natural gas. Solar and wind are responsible for about 20 percent of the decline. And as for izndustry regulations? They’re responsible for only 3.5 percent of coal’s decay, the study’s researchers say. In light of this, I think it would be prudent for investors in natural resources and energy to adjust their holdings to reflect this transition. In the past year, we’ve overweighed renewable energy stocks in our Global Resources Fund (PSPFX), and the allocation is now a core driver of the fund’s performance. Let’s look at the facts. This month, just as Trump was celebrating the opening of a new coal mine, British oil and gas company BP reported in its annual review of global energy trends that coal production saw a record decline in 2016. Coal fell 6.2 percent, or 231 million tons of oil equivalent (mtoe), on a global scale. In China, the decline was even more severe. The U.S. might not have had a coal-free day, but domestic consumption is definitely in freefall. Last year, for the first time ever, natural gas represented a larger share of U.S. electricity generation than coal. Gas provided 34 percent of the nation’s power, coal 30 percent. This gap will only widen as more coal-fired plants are converted to burn natural gas, which is cheaper and cleaner. Facilities that still burn coal are rapidly aging into obscurity, with a vast majority of them (88 percent) built between 1950 and 1990. 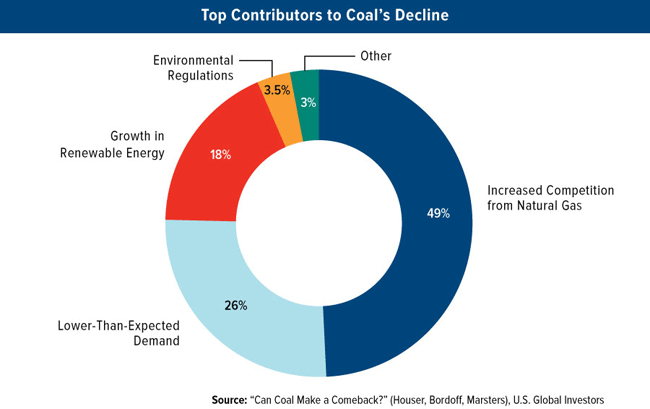 Coal is also facing steep competition from renewables. 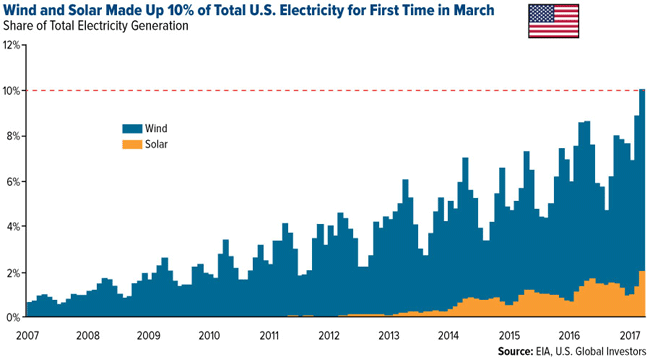 For the first time in March, wind and solar made up 10 percent of total U.S. electricity generation, according to the U.S. Energy Information Administration (EIA). Windfarms in Texas, Oklahoma, Iowa and other states provided 8 percent, while commercial and residential solar installations represented about 2 percent. As I shared with you last month, 2016 saw record installation of new renewable capacity across the world, with investment in wind and solar double that found in coal, gas and other fossil fuels. In the U.S., solar ranked as the number one source of new electricity generating capacity. Part of the reason we’re seeing such significant growth in renewable capacity is that solar and wind make good economic sense. 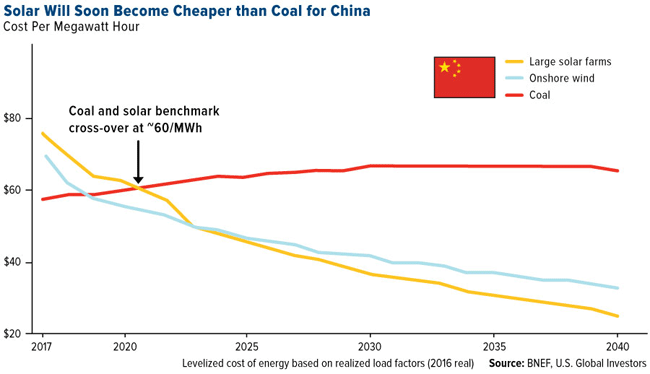 Bloomberg New Energy Finance (BNEF) recently reported that solar costs already rival coal in Germany and the U.S. and very soon will do so in China, the world’s largest investor in renewable energy. For years, solar has been regarded as an inefficient and costly source of energy. But its economics are now beginning to become cheap enough to potentially push coal and even some natural-gas plants out of business faster than what was once previously forecasted. According to BNEF, costs of new energy technologies are falling so fast that it’s more a matter of when than if solar power and alternative energy sources gain a larger market share than fossil fuels. BNEF now estimates that China and India, the two most populous countries, represent a $4 trillion investment opportunity in new energy capacity by 2040, with most of the investment (nearly 75 percent) in wind and solar. Although coal will likely be needed to meet the huge population explosions in the two economic powerhouses, its role will steadily diminish, falling to a 17 percent share in India by 2040, according to BNEF estimates. Renewables, meanwhile, will represent about half of all energy capacity. Frank Holmes is CEO and chief investment officer of U.S. Global Investors, Inc., which manages a diversified family of mutual funds and hedge funds specializing in natural resources, emerging markets and infrastructure. The company’s funds have earned more than two dozen Lipper Fund Awards and certificates since 2000. The Global Resources Fund (PSPFX) was Lipper’s top-performing global natural resources fund in 2010. In 2009, the World Precious Minerals Fund (UNWPX) was Lipper’s top-performing gold fund, the second time in four years for that achievement. In addition, both funds received 2007 and 2008 Lipper Fund Awards as the best overall funds in their respective categories. He is also an advisor to the International Crisis Group, which works to resolve global conflict, and the William J. Clinton Foundation on sustainable development in nations with resource-based economies. Mr. Holmes is a much-sought-after conference speaker and a regular commentator on financial television. He has been profiled by Fortune, Barron’s, The Financial Times and other publications.